The Society of Teachers of the Alexander Technique will be appearing at Your Horse Live 2012 to promote the benefits of the Alexander Technique to horse riding. Your Horse Live 2012 has a wealth of expertise on show, from top riders such as Charlotte Dujardin and Carl Hester to new and innovative products for the equine market as well as the Alexander Technique which will be featured in the Improve Your Riding Zone. The society funds this stand and all the teachers kindly volunteer their time to show the horse riding public what the Alexander Technique is all about and how it can help you as riders. This will be my second year volunteering on the stand and Your Horse Live 2012 is my first year of being chief organiser. Last year was a great success and we managed to give people a real experience of the technique. As in previous years the teachers on the stand (including myself) will be offering taster sessions to people who want to know more about the Alexander Technique, how it can help improve their riding or find a teacher local to them. The Society of Teachers of the Alexander Technique’s stand is number M42 and can be found in the Improve Your Riding Zone. 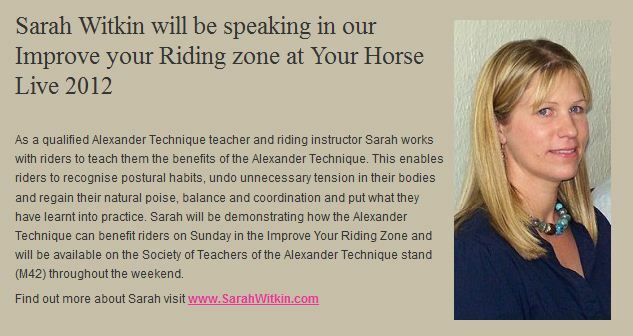 Also going on in the Improve Your Riding Zone is a timetable of talks / demonstrations on a variety of topics, including the Alexander Technique. Sally Tottle will be giving demonstrations on Saturday at 11:30 and 15:15 and I will be demonstrating at 11:30 and 16:00 on Sunday. This is a great opportunity to observe the Alexander Technique in action and I’ve even got my own page! If you are planning on attending Your Horse Live this year then please come and visit us on the stand, maybe try a taster session and discover how the Alexander Technique can release tension, enable you to rediscover balance of mind and body, ride with less effort and a better position in the saddle. The stand is M42 in the Improve Your Riding Zone . Next post: Do you struggle to keep good posture?